The knives are out for Brazil’s election now that former President Cardoso has written an opinion piece in the influential European business newspaper Financial Times in which he openly criticized his now jailed successor, former Brazilian president Luiz Inácio Lula da Silva regarding his right to run in this year’s presidential election. Given the uncertainty as to the outcome of Brazil’s election this year, many business media around the world (Wall Street Journal, Bloomberg, the Financial Times) have started to take an interest in the upcoming election in the largest nation in South America, in which the rightwing conservative Mr Jair Bolsonaro currently leads in the polls. 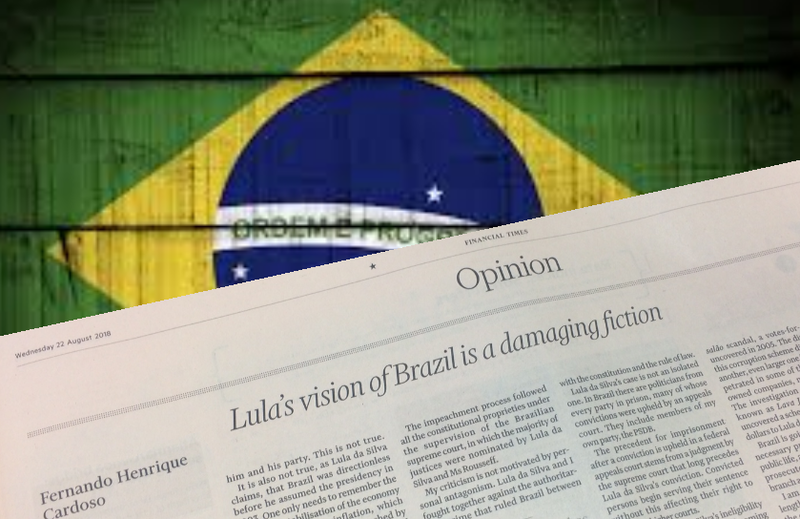 The British Financial Times, seen as one of the most influential business newspapers in Europe, lent it’s editorial space yesterday to Mr Fernando Henrique Cardoso, Brazil’s president from 1995 to 2003. In the past few days, the New York Times had given a similar editorial piece to Mr Jorge G. Castañeda, the former Mexican Minister of Foreign Affairs who tried to influence the reading public to allow Mr Lula da Silva, currently imprisoned for corruption, to run in this year’s election (see our related coverage). Related coverage: <a href="http://thegoldwater.com/news/34748-New-York-Times-Editorial-Illegally-Promotes-Brazil-Election-Meddling">New York Times illegally promotes Brazil election meddling</a>. Related coverage: <a href="https://thegoldwater.com/news/31143-Brazil-Three-Months-Before-Elections-Far-Right-Candidate-Bolsonaro-Still-Leads">Bolsonaro still leads polls</a>. Current polls indicate that Mr Jair Bolsonaro is leading the popular vote with 20-23%. Brazil goes to the polls in October.